I scream you scream we all scream for ice cream. Like I’ve stated previously, I have a weakness for ice cream. So I bet you wouldn’t be surprised to know that I have a ice cream maker…so I decided to dust it off and make some ice cream. I had bought some blueberries at the store and I wanted to use them in a different way…as much as Dan would have liked to have a blueberry pie…I honestly can’t stomach blueberry pie. 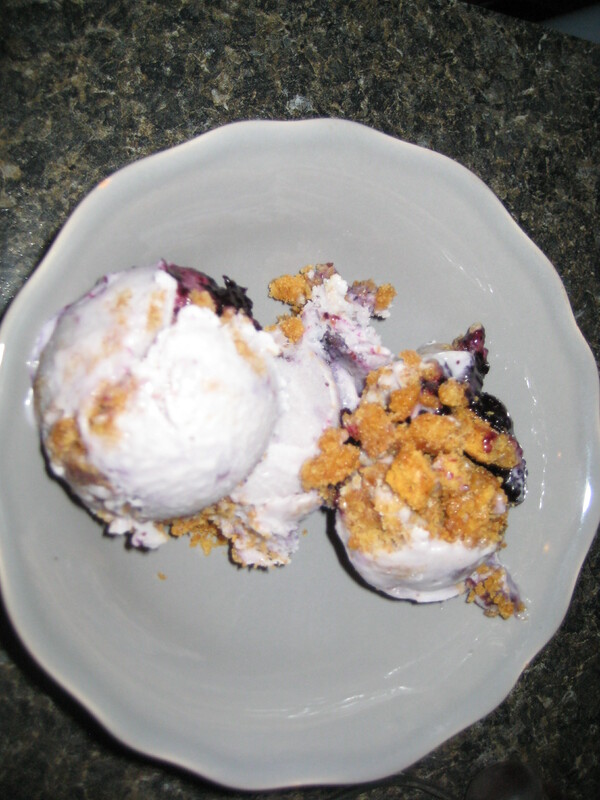 So I decided to make blueberry cheesecake ice cream. 1) Heat sugar and berries in a small saucepan, and bring to a boil. 2) Mash gently with the back of a spoon. Stir to dissolve sugar. 3) Remove from heat and set aside to cool. Cover and chill until time to use. 2) Stir the butter and sugar into the graham crackers until all of the crumbs are coated. 3) Press onto a parchment lined baking sheet into a single layer about 1/4 inch thick. 4) Bake for 10 minutes or until golden brown. 5) Cool completely before crumbling. Once cooled, crumble and place in a zip top bag in the freezer. 1) Mix about 2 tablespoons of milk with the cornstarch in a small bowl to create a smooth slurry. In a large bowl, whisk the mascarpone cheese, cream cheese, and salt together. 2) Combine the remaining milk, cream, sugar, and corn syrup in a 4-quart saucepan. 3) Bring to a rolling boil over medium-high heat and boil for 4 minutes. 4) Remove from heat and gradually whisk in the cornstarch slurry. 5) Bring the mixture back to a boil over medium-high heat until slightly thickened, about 1 minute. 6) Gradually whisk the hot milk mixture into the cream cheese mixture until smooth. 7) Whisk in half of the blueberry compote. 8) Cover bowl with plastic wrap and chill over night. 9) Churn, baby churn. Churn your ice cream according to your ice cream maker’s instructions. Once churned layer in an air-tight container with the remaining compote and crumbs. Freeze for 4 hours. 10) Scoop and serve! (Or do what Dan and I did…just eat it out of the container).